A few months ago, a Google Earth Community member called 'Core5' proposed an idea for showing maps using data produced by NOAA which can show the areas where viewing aurora might be likely. Core5 wanted to present those maps in Google Earth. It took a while, but he finally got in touch with the NOAA people who produced the data, and they helped implement maps in the GE format (KML). Core5 recently posted this automatically updating Aurora viewing map at the GEC. NOAA has developed a preliminary "user guide" which you can read here (the file is not officially published yet). Instruments on board the NOAA Polar-orbiting Operational Environmental Satellite (POES) continually monitor the power flux carried by the protons and electrons that produce aurora in the atmosphere. 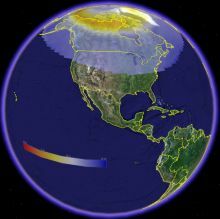 SEC has developed a technique that uses the power flux observations obtained during a single pass of the satellite over a polar region (which takes about 25 minutes) to estimate the total power deposited in an entire polar region by these auroral particles. The power input estimate is converted to an auroral activity index that ranges from 1 to 10. Core5 is to be commended for his persistence in making this happen. 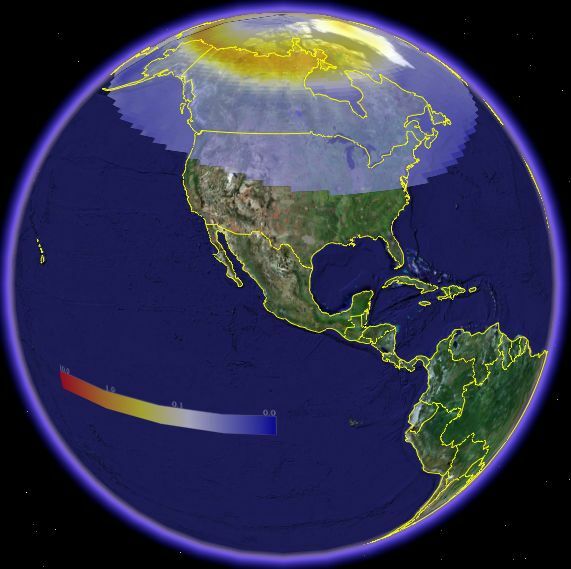 And, NOAA is also to be commended for implementing this visually powerful tool which may help many people see an aurora who had never seen one of these awe-inspiring natural firework events. NOTE: there is no guarantee you will see an aurora based on these maps. 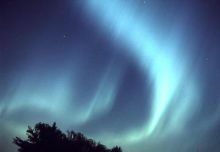 They are like a weather map which shows you the probability that an aurora might be viewable from a given location. Weather itself could also be a factor since you can't see Aurora through clouds.